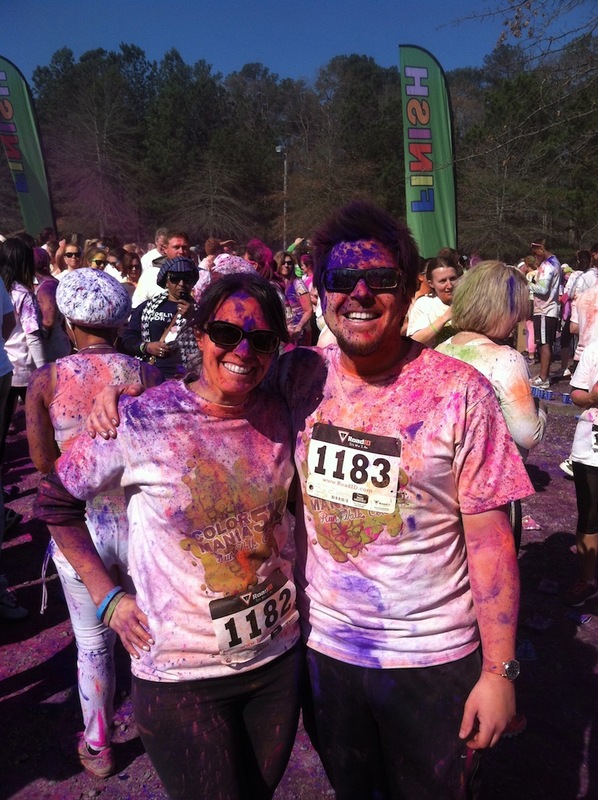 So this morning, April 6, Jay and I did a color run! 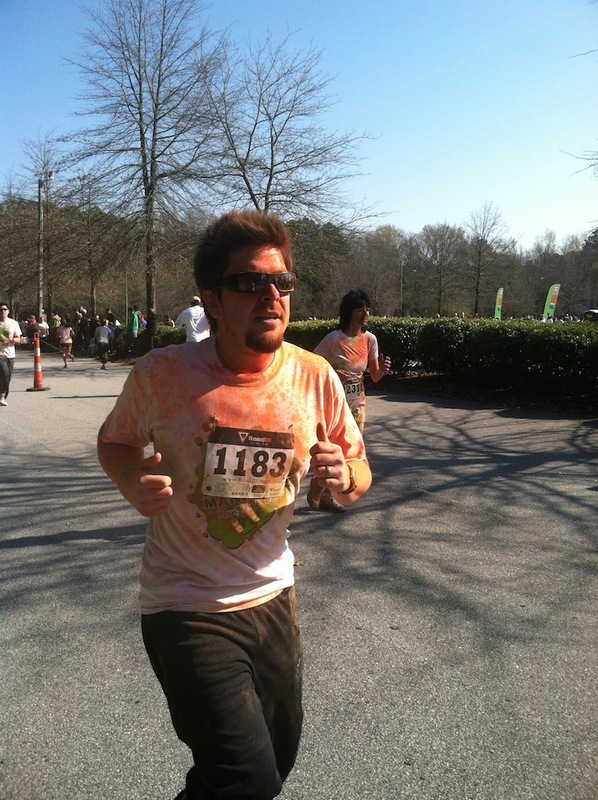 It was the Color Mania 5K. 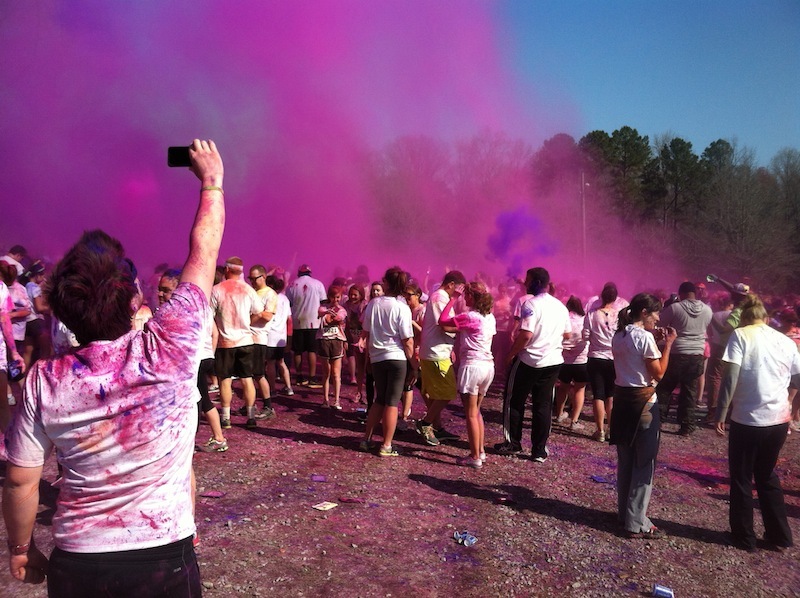 If you’re unfamiliar with the growing trend of color runs, here’s the quick rundown: A color run is a walk/run, generally a 5K (3.1 miles), where at every kilometer, you’re dosed with different colored powder. There’s no higher calling or purpose to this run other than just getting some exercise while having a really damn good time. You can run as a team for whatever reason you want, but as far as I understand, the actual organizations running the race don’t do it for any higher calling other than fitness and fun. 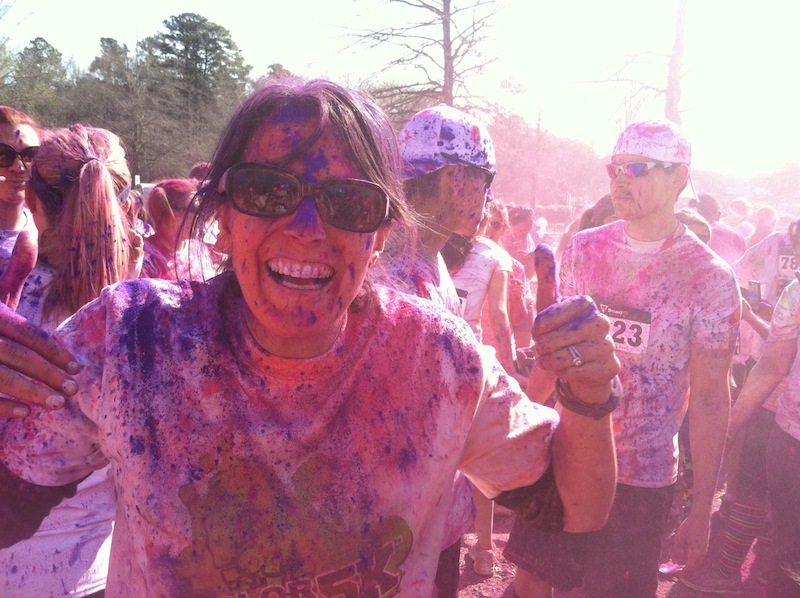 There are three main color races: The Color Run (the original), Color Mania 5K, and Color Me Rad. Jay and I would like to do all three races, if possible. 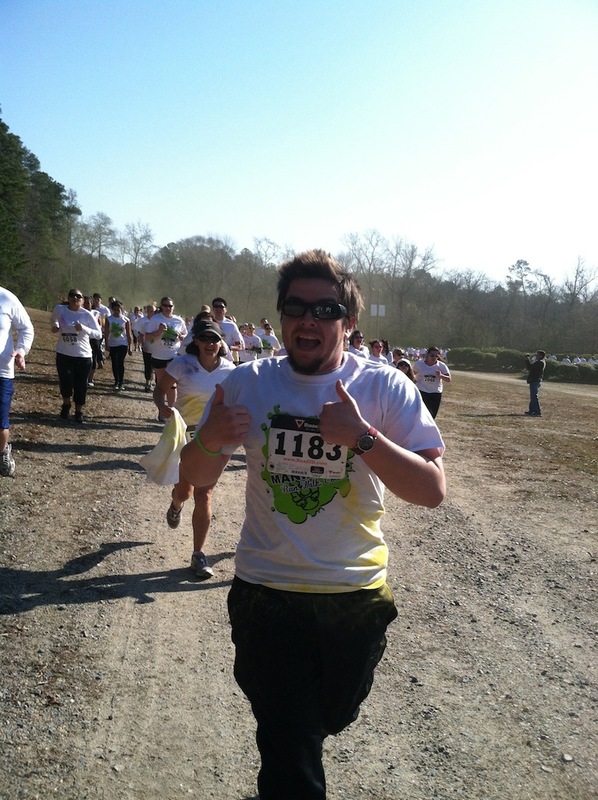 This was Jay’s first 5K. 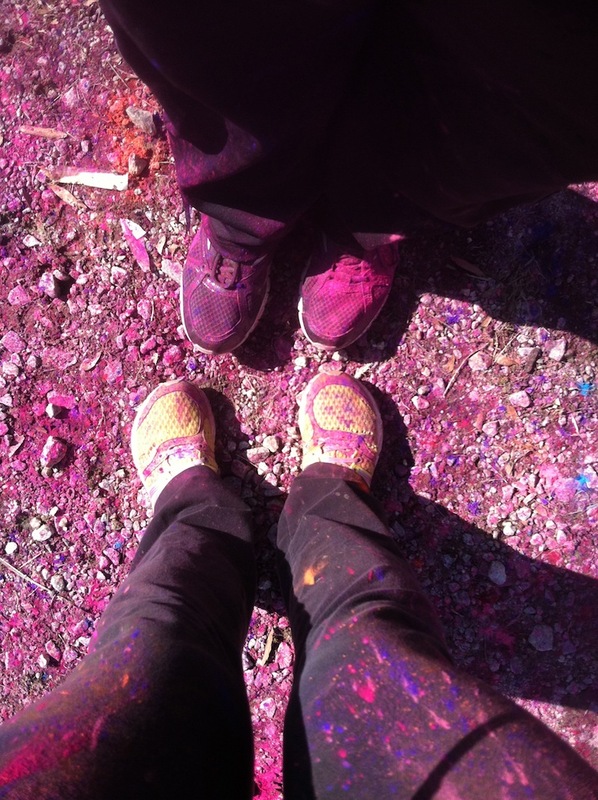 My husband was not a runner. He was always a great sport when it came to walking with me for five miles, but that was it. Give him a racquetball court and he was happy, but running was not his thing. As someone who grew up in a household that stressed physical fitness, particularly in the form of running, it’s always easy for me to understand why someone would hate running but difficult for me to understand why someone couldn’t run. I naively thought everyone could do it, lol. 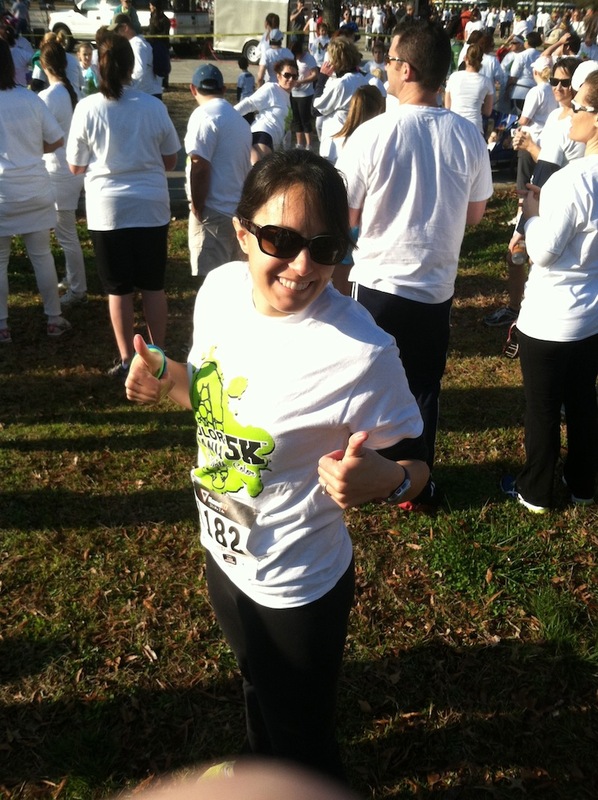 When I went through a two-year period of not running because of my poor, tired knees (I’d walk miles & miles instead), my way of getting back on the running wagon last year was to start out at 35-minutes and work my way back up to where I was before. To me, someone who couldn’t run even 15 minutes didn’t exist. Stupid, I know. 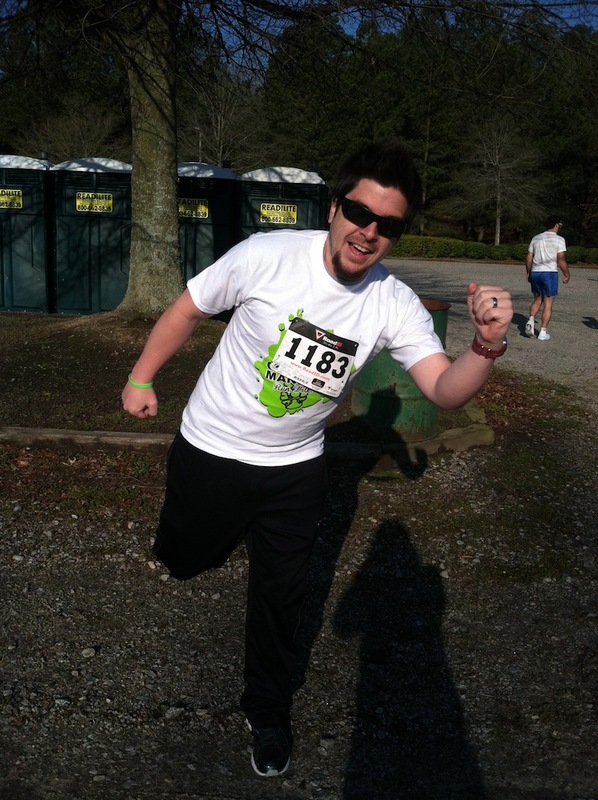 That said, I still firmly believe that there is a runner inside of everyone. I don’t have enough words to express how proud I am of Jay for going from barely being able to run 15 minutes to being able to run 35 minutes in just five weeks. 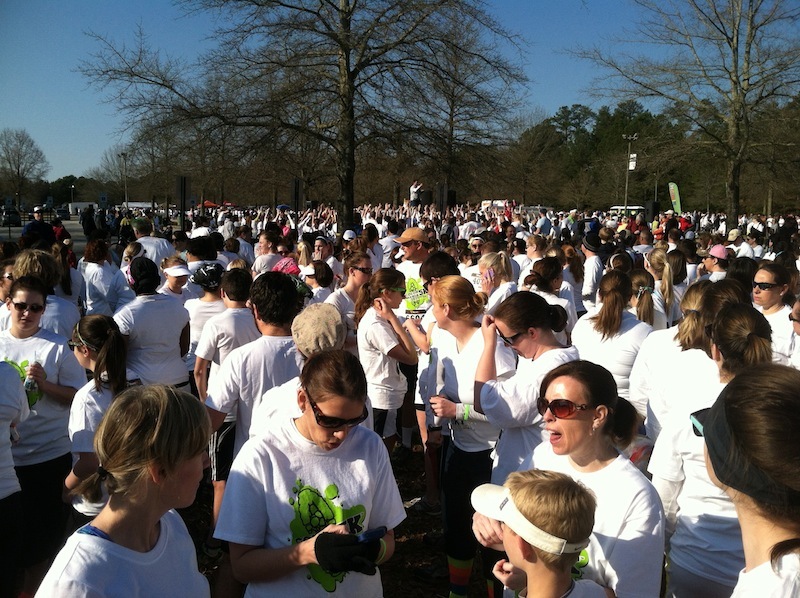 We finished the 5K today in 30:35, which is about a 10 minute mile pace. On a personal level, I am really surprised at how fulfilling it has been to run with Jay the past couple of weeks. I’m kind of just now getting why my dad asked me to go running with him all of those years growing up. As a teenager, I always assumed it was because my parents thought I was unhealthy and “getting fat” (figuratively) after I quit running cross country in favor of doing school plays and editing the school newspaper. I’ve begun to recognize and appreciate that my daddy just wanted an hour of uninterrupted time to hang out with me. 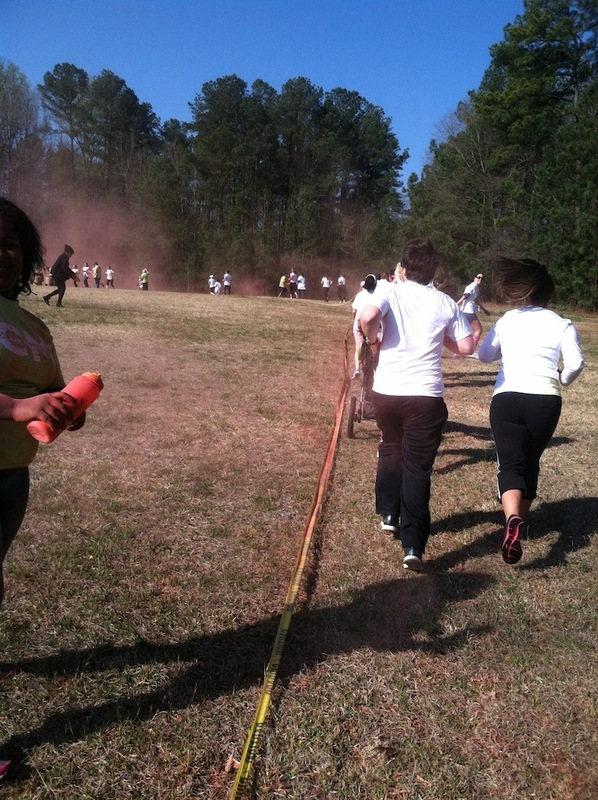 The race started 20 minutes late, but that was pretty much the only snafu. Actually, I’m just kidding. Jay and I both forgot to bring towels to sit on in the car after we were finished, so we ended up having to take his car to a carwash to get professionally vacuumed out aftewards. 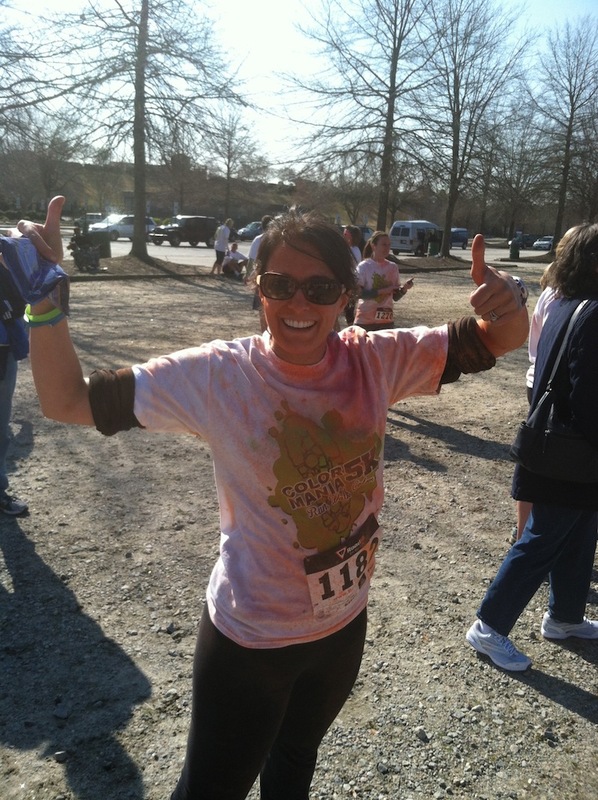 That would be my one recommendation to any Color Run newbie: Bring something to sit on so you don’t get your car dirty! Anyway, the course was easy – there weren’t many hills at all and a lot of it was weaving in and out on fields. 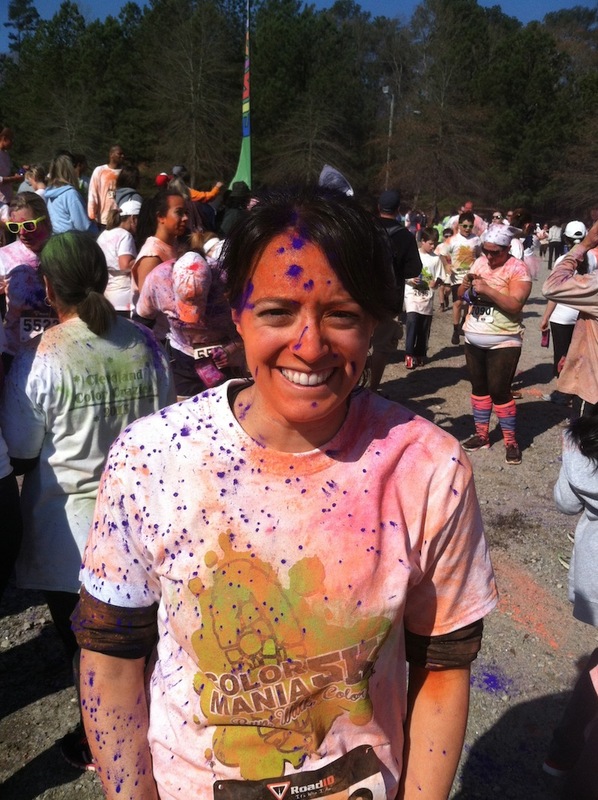 The volunteers who were spreading the color fun were generous when “coloring” you, particularly the ones who did the last two colors. There was also such a broad range of participants: it went from children who couldn’t have been more than 5 or 6 years old to mothers with strollers to senior citizens to a group of young adults dressed in tutus. It was not only fun to run it, but an absolute blast to people watch. 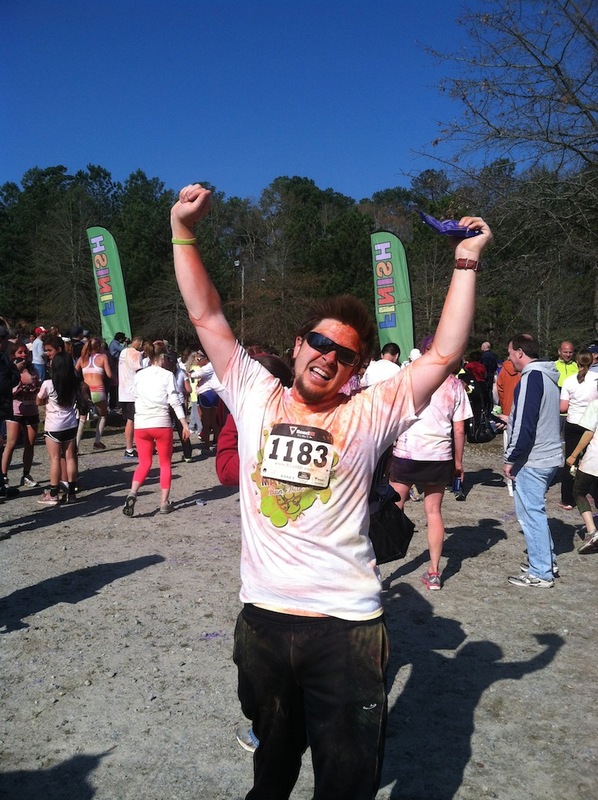 If you’re looking for something fun to do to either motivate you to get in shape, motivate you to move around on a Saturday morning, or do with your friends, then I completely recommend doing a color run. 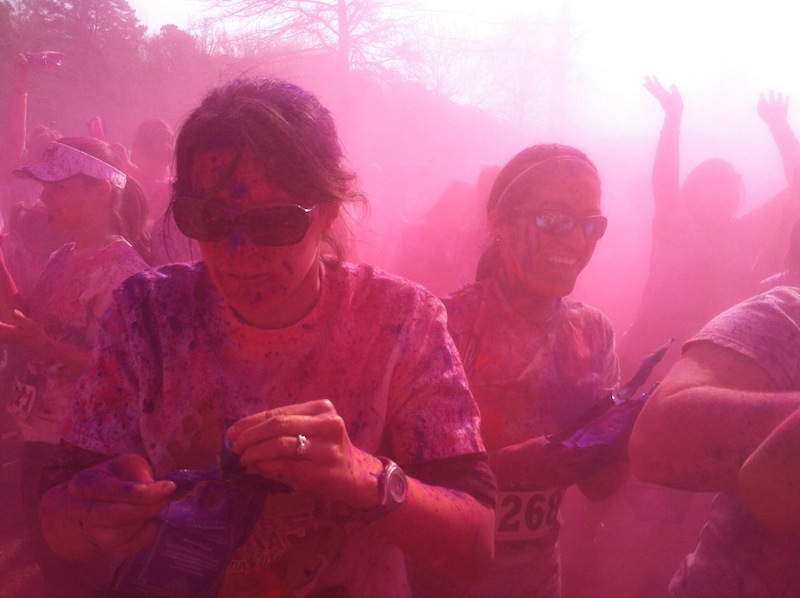 If you do a Google search for “color runs in <your area>,” you should be able to find something out of the three main events. Good luck and have fun! Here’s the day told in pictures. More pictures are on my Facebook page and my Instagram. Jay and I are ready to run! The crowd waiting to start. The D.J. in the background gave away freebies and MC’d the entire event. Jay after he got his yellow. 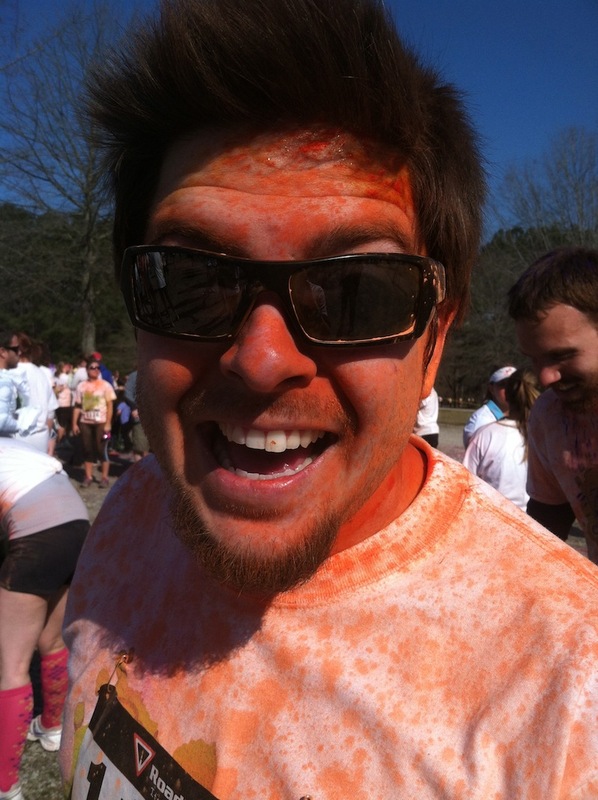 Below, after he got his red and right before they sprayed me. I call this “Tan Mom” face. 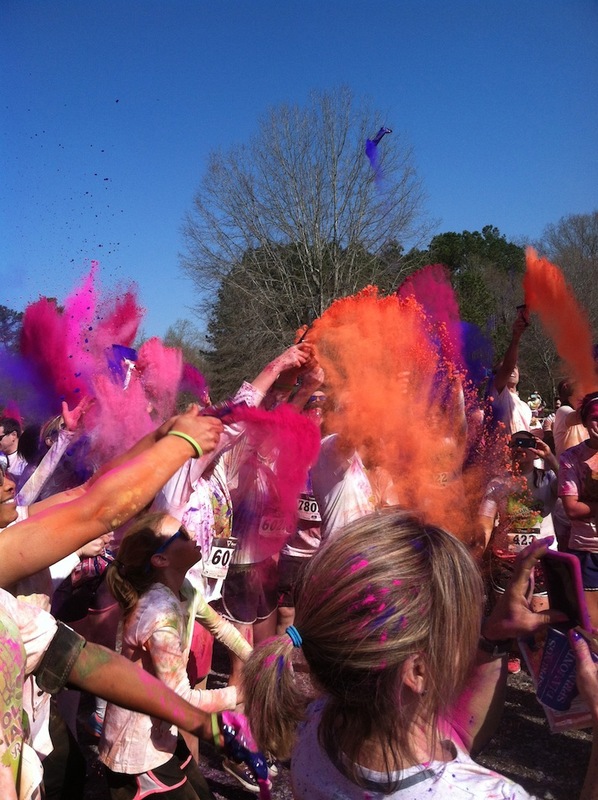 Picture of the first “Color Drop” as it started. Trying to open my packet in a haze of pink after taking the first picture at the start of it. I’m retiring my all-time favorite sneakers as of this run. I felt it was an appropriate run for them to go out on. Here’s a look at our bottom halves, lol. By the way,*this* sat in Jay’s new car without towels or anything else. 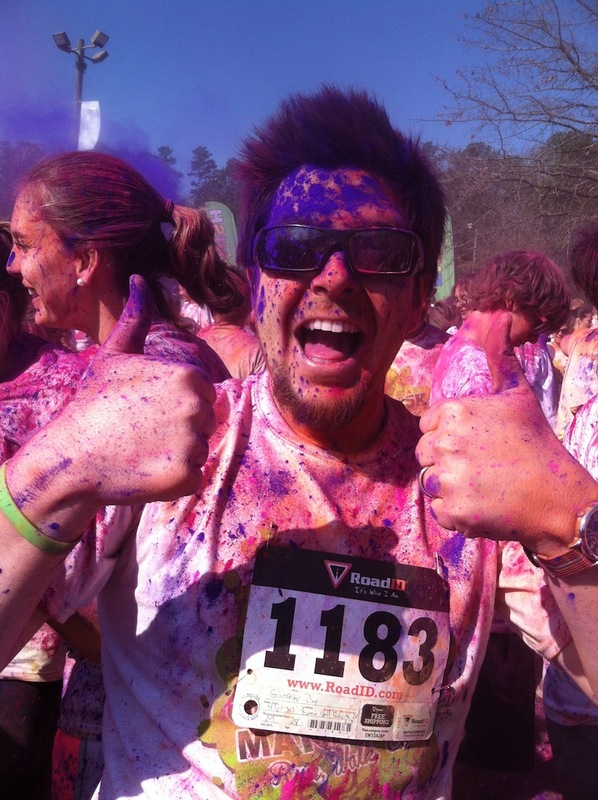 This entry was posted in Fitness, Good times, Jay Glatfelter and tagged Color Mania, Color Mania 5K, Color Run, Running. Bookmark the permalink.